I’m not going to do a real review of this book because I’m swamped (if you want a brief summary of the book’s thesis, read this); this is just a brief note that if you have the slightest interest in Mormonism, you are going to want to read this. It’s phenomenal. 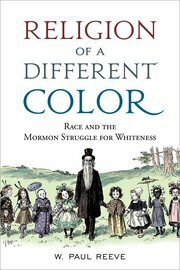 It’s a total game-changer in terms of thinking about Mormonism, race, and outsider perceptions of Mormonism. The history is fascinating, the analysis is trenchant, the message about race is provocative. I think we’ll need to re-examine some of what we thought we knew about Mormon history and theology in the wake of this book. So: move this to the top of your to-read pile. I read the sample on my Nook yesterday and found it to be very interesting. Certainly am going to purchase when I get the chance.